I loved Popsicle's as a little girl and now as an Adult. I love to make all kinds of flavors, adding some alcohol makes these for Adults only. 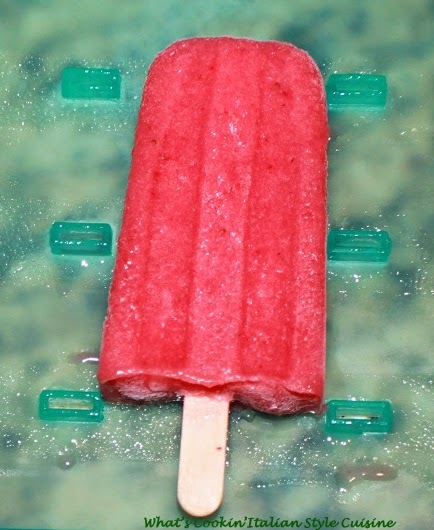 You can always substitute juice like pineapple, orange, apple or grape to make them a non alcohol Popsicle. After all these years I finally invested in a Popsicle mold ( I would use ice cube trays and toothpicks) and boy do I ever love my new toy. It's just the beginning of a wonderful summer of fun and experimenting to keep cool! Here are some suggestions below on flavor combinations and check out the video for more instructions. Blend the fruit of choice in a food processor or high powered blender add the rum and colada mix, you can substitute apple juice, grape juice or anything else you like in it place. Strain in a fine mesh sieve. Add any two kinds of fruits together, bananas, strawberries, berries, kiwi, pineapple, etc. 1/2 cup of liqueur of choice, Vodka, Rum, Flavored Vodka's or flavored Rum. Proceed with above instructions. In a saucepan bring sugar, water and lime zest to a boil and simmer for 5 minutes to dissolve sugar. Stir in remaining ingredients. Add to pop molds, if using passion fruit when it's half way frozen stir to mix the seeds evenly. Bring the milk and heavy cream to a boil. Remove from heat and cool for 5 minutes. Place the chocolate in a glass bowl and pour the milk over the top. Stir until melted. Add the rum. Whisk the eggs and sugar in a bowl and then blend with chocolate mixture. Cover with plastic wrap and place in the freezer for around 2 hours. Place in an ice cream maker. Churn around 20 minutes. Pour into the pop molds and insert sticks. Freeze for around 24 hours before removing.